To recognize that He is the Supreme, we have to develop our mentality and that is why worshipping him is necessary because we are preparing our mentality to accept Him. Devotee should only serve the Supreme Personality of Godhead. 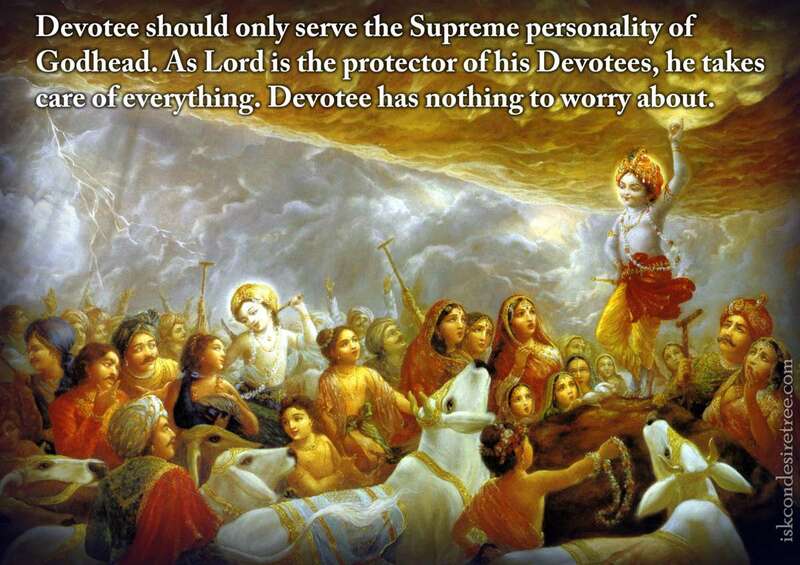 As Lord is the protector of His Devotees, he takes care of everything. Devotee has nothing to worry about. When it comes to offering to Krishna and if we love Krishna then we will offer Him something that is very dear to us. We do not have to hide anything from Krishna or we should never think that – Well Krishna is not watching or Krishna is not seeing. Krishna is seeing everything. Unless and until we surrender to Krishna, Krishna is not going to take our responsibility. The consideration of becoming a devotee is the association and guidance of a devotee. Love of God is the real source and when one abandons that loving real relationship of God, he suffers.